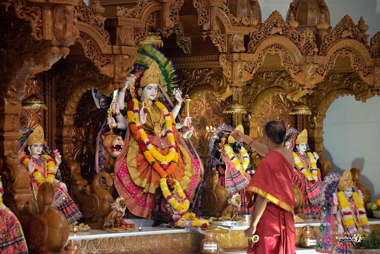 (Left) Sri Bhaishri Rameshbhai Oza offering puja. The 25th-anniversary celebration began on June 20, 2018 with a Bhagwat Katha orated by Sri Bhaishri Rameshbhai Oza. The celebration was consummated with Rajat Jayanti Mahotsav and Punha Pran Pratishta poojas from June 25th through Sunday, July 1st. Many thousands of Mataji’s devotees travelled from near and far in the festivities. Almost two-week-long celebrations were full of seva, excitement, and devotion. The high number of volunteers who willingly gave up their time to perform seva was a testament to divine shakti. (Left) Making an aarti offering to Ambay Maa. In 1990, Amba Maa’s group of dedicated devotees started by renting a space in a small shopping complex to create a unique area where the local Hindu community could go to as a place of worship. 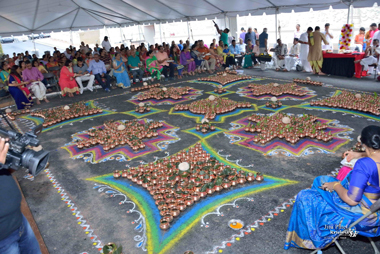 As the community grew in south Atlanta, the group acquired land and resources to build Shree Shakti Mandir, aka Ambaji USA, in Lake City, Georgia. On June 6, 1993, the dream was realized when Pran Pratistha was performed. Since its inception, Shree Shakti Mandir-Ambaji USA, also known as Mandir, has served the Hindu community by regularly performing poojas, religious services performed by priests and celebrating Hindu festivals such as Maha Shivratri, Holi, Janmasthmi, Navratri, and Diwali. Weekly Saturday ​satsang and spiritual lectures on Hinduism as well as educational teachings for our youth with an emphasis on seva are all part of the ​mandir’s activities. In addition, an annual youth camp is organized to nurture Hindu value and culture. (Left) A rapt audience of hundreds listening to Rameshbhai Oza’s katha. Furthermore, Shree Shakti Mandir–Ambaji USA provides a traditional prasad (sanctified meals) for all devotees 365 days of year. With the dedication of devotees, volunteers, management, and staff, Shree Shakti Mandir-Ambaji USA has developed into one of the most visited ​mandirs in the Southeast region.